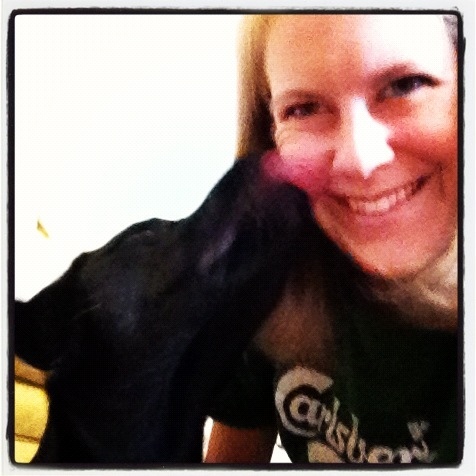 Let’s start the day off with some puppy kisses. Whenever I sit on the floor with Rachel, she gets super cuddly, especially when I pull a fleece blanket around us. Walking/running/hiking with her so much has left me exhausted, so I needed some time to relax before heading to work. A little “Veronica Mars” and puppy cuddles — and a slice of toasted Cranberry Walnut Pumpkin Loaf — made for a great morning. This bread, the latest recipe for Tuesdays with Dorie, needed little hands-on time, aside from some good kneading. (It’s a good workout though if you don’t have a KitchenAid!) But then the dough had to just sit, and sit, and sit, so that the yeast could do its job. And it did. 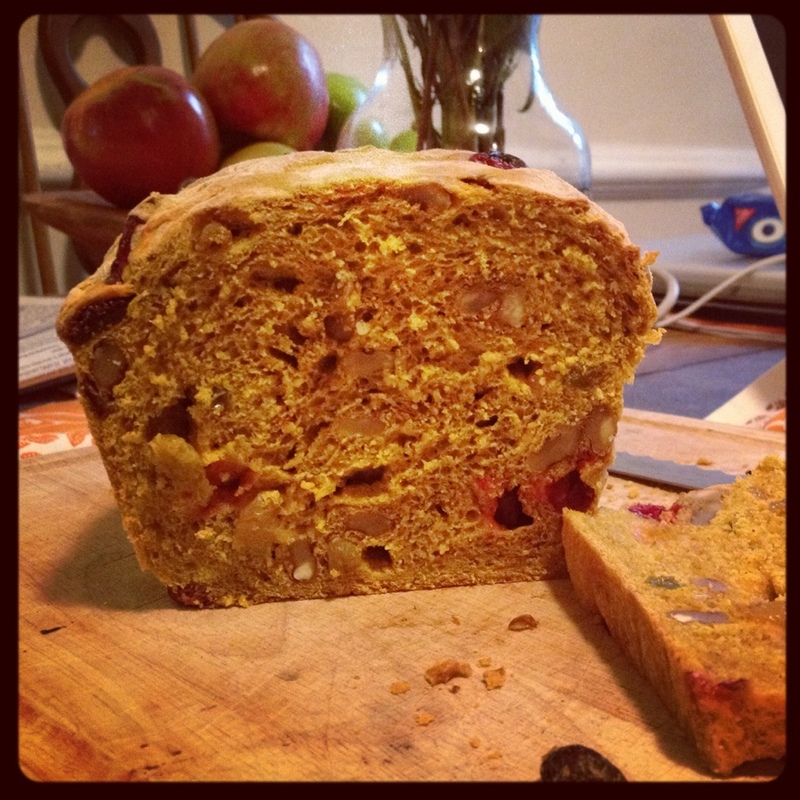 The loaves had a delightful light and chewy texture, studded with tart cranberries, sweet raisins and crunchy walnuts. My parents, who used dried cranberries, said the bread was balanced. I thought the frozen cranberries may have been a bit too sour, but they were beautiful jewels set in the orange bread. But obviously this was no regular pumpkin bread. With only 1/3 cup of sugar and no chocolate chips, it wasn’t like your regular sweet pumpkin quick bread. I’m going to have to make a simple loaf soon, since it was October. But still, this was a good bread that I’ve been eating toasted with butter, peanut butter, cream cheese, and also alongside a curried butternut squash soup. Katie – I’m thinking that if you rolled it with cranberry sauce in the middle this might be outrageous! I like your eating style! 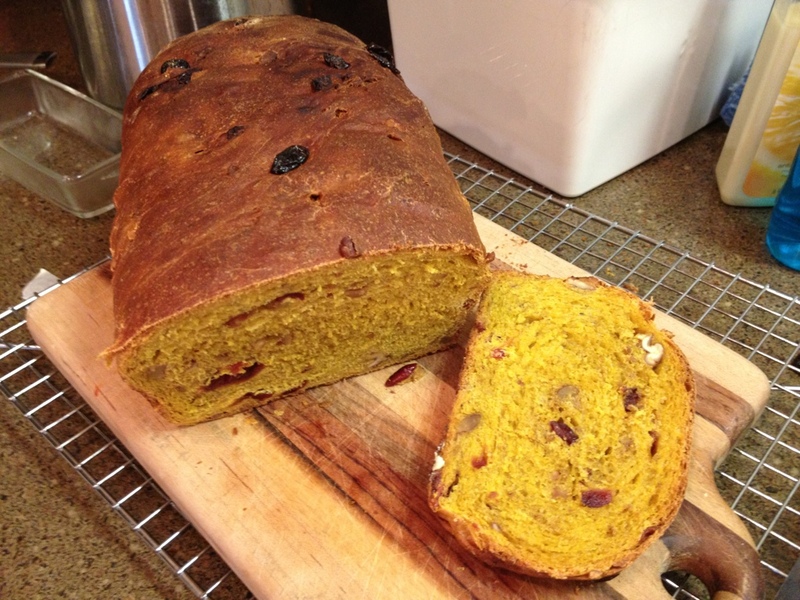 I must make a quick pumpkin bread with chocolate chips just to quell that craving. But this recipe was delicious in its own right.